This is my *new* car. A 2007 Dodge Charger Daytona R/T "Plum Crazy" No. 970/1400. Note the purple shirt the handsome eye candy is wearing. It was purchased before the car was. BU2 Call took the pics on my BB. 1. Your President is lying to you. 2. This war is wrong and illegal. 3. You cannot win the war. Sound familiar? Maybe it's because the U.S. mainstream media and the Democrat Party has picked up the same message and is broadcasting it to our troops. The only difference is that they claim to support our troops before they demoralize them. Come to think of it, Tokyo Rose used to tell the troops she was on their side. Tokyo Rose was wrong then just like the mainstream media and Democratic Party are wrong now. Japan lost their war and Tokyo Rose was convicted of Treason. If only we could get the same results for the media and some of those Democrats. The Jews are not demonstrating with their dead on the streets, yelling and chanting and asking for revenge. The Jews are not promoting brain washing their children in military training camps. The Jews are not teaching their children how to blow themselves up and cause maximum deaths of Jews and other non Muslims. The Jews don't have the economic strength of petroleum, nor the possibilities to force the world's media to see "their side" of the question. The leaders of most oil producing Muslim countries are extremely wealthy while the citizens live in poverty, and that fact explains to a large extent why they have such enmity towards them. Isreali leaders have usually proven themselves in harrowing, and often, life threatening situations. Muslim leaders usually inherit their positions. Call me crazy, but as far as Decency, Honor, Courage, Motivation, and yes, Righteousness is concerned, I'm going to side with the Jews. The Department of Navy announced March 23 that the Navy's newest Arleigh Burke-class guided-missile destroyer will be USS Jason Dunham (DDG 109), honoring the late Cpl. Jason L. Dunham, the first Marine awarded the Medal of Honor for Operation Iraqi Freedom. "Jason Dunham, the friendly, kind-hearted, gifted athlete who followed his star in the United States Marine Corps went on to become one of the most courageous, heroic, and admired Marines this great country has ever known," said Winter. "His name will be forever associated with DDG 109. May those who serve in her always be inspired by the heroic deeds of Jason Dunham, and may all of us strive to be worthy of his sacrifice." In May of 2004 Cassandra posted a touching article from the Wall Street Journal about the self sacrafice of Marine Cpl. Jason L. Dunham here. The WSJ article was written by Michael M. Phillips from the book, The Gift of Valor which gives a unique perspective on who Cpl. Dunham was. I can't add anything to what has been written about Cpl. Dunham that would be any better than what has already been written by others. I'm not expressive enough, or eloquont enough. But I can say that I'm grateful for his sacrifice and the sacrifices of all members of our Military. I'm grateful that they are willing to give up much, and in some cases, like Cpl. Dunham, to give up all, to do a nasty job that must be done. That the U.S. Navy would name a new warship after a Marine speaks volumes of the regard they hold him in. It's the highest Honor the Navy can bestow. Not only cans for the money, but paper, plastic, glass, hypodermic needles, condoms and anything else that could possibly be recycled? Are you the type of person who will only drive your solar powered car if you have to go more than 20 miles, otherwise you'll ride your bicycle because you hate to waste solar energy? If that is you then you need to see THIS VIDEO. Go ahead, look at it. Amy brings us Part II, and a little clarification. when they take credit for what others say. how was I to know that it was going to last. but indeed at the end there is no name. it's not Kilmer, Longfellow, Service, or Poe. He's proud of the ole Red, White and Blue. The Final Inspection is the name. and of my buddies who died for country and you. because in Heaven I'll see my God. others read your poem and you made them glad. and come inside with all the rest. First Lady Hillary Rodham Clinton, appearing on NBC's "Today" show, charged the allegations against her husband were the work of a "vast right-wing conspiracy." Coining the name of a movement that many of us are proud, card carrying members of is Hillary's greatest political acheivement. Approximately one Chronon later I became a member. This is from the Xena Netforum of about 10 years ago. It's an excellent example of what can be done with a popular TV program and some very clever contributors. [Maidens] Yes, yes, she is a buff barbarian. [Chorus] To tell if their relationship's sororal or sapphistical! Aware that his opponent is the Basileia Makhetes! [The music crashes to a halt, as the Chorus stares at Xena in utter confusion. She sighs.] It's Greek. It means "Warrior Princess"! [Light dawns on the Chorus, and the music resumes.] Sheesh . . .
[Chorus] He knows that his opponent is the Basileia Makhetes! [Chorus] We'll say she's twice the heroine of any in Euripides! Many people think that speed and acceleration are the same thing, but that's only true in the sense that I and a newborn child are the same. While I have reached a measure of stability in life, the newborn is just starting on its journey. Speed is the goal. Acceleration is the journey. I like speed. Fast music, fast cars. Things like that I like fast but the thing about cars I like the most is acceleration. When I put my foot about 1/4 inch down on the gas pedal my mighty Mopar answers by pushing me gently back into the leather seat. When I push my foot down about half way I feel like I don't really need seatbelts due to the force gripping me to the seat. I bring this up because of Top Fuel Dragsters. I absolutely love 'em. I get almost orgasmic just watching a race. I'm not talking about some namby/pamby Daytona or Indy racer, no. I'm talking about some serious horsepower. Under full throttle, a Top Fuel dragster engine consumes 11.2 gallons of nitro methane per second; a fully loaded 747 consumes jet fuel at the same rate with 25% less energy being produced. A stock Dodge 426 Hemi V8 engine cannot produce enough power to drive the dragster's supercharger. At the stoichiometric 1.7:1 air/fuel mixture for nitro methane the flame front temperature measures 7050 degrees F ( 3900 degrees C ). Nitromethane burns yellow. The spectacular white flame seen above the stacks at night is raw burning hydrogen, dissociated from atmospheric water vapour by the searing exhaust gases. 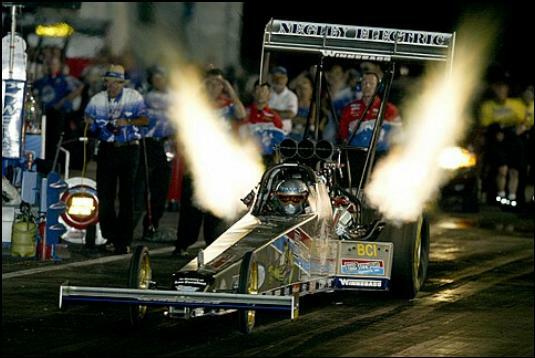 In order to exceed 300 mph in 4.5 seconds dragsters must accelerate at an average of over 4G's. In order to reach 200 mph well before half-track, the launch acceleration approaches 8G's. 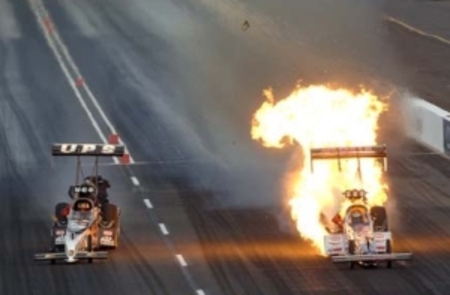 Top Fuel Engines turn approximately 540 RPM's from light to light! but stop & ponder the fact that the engine is only used for apx 4 to 5 seconds. Including the burnout the engine must only survive 900 revolutions under load. The red-line is actually quite high at 9500 rpm. The Bottom Line; Assuming all the equipment is paid off, the crew worked for free, and for once NOTHING BLOWS UP, each run costs an estimated $1,000.00 per second. The current Top Fuel dragster elapsed time record is 4.441 seconds for the quarter mile 10/05/03, (Tony Shumacher). The top speed record is 333.00 mph (533 km/h) as measured over the last 66' of the run (09/28/03 Doug Kalitta). Putting all of this into perspective: You are riding the average $25,000 Honda MotoGP bike. Over a mile up the road, a Top Fuel dragster is staged and ready to launch down a quarter mile strip as you pass. You have the advantage of a flying start. You run the RC211V hard up through the gears and blast across the starting line and past the dragster at an honest 200 mph (293 ft/sec). The tree' goes green for both of you at that moment. The dragster launches and starts after you. You keep your wrist cranked hard, but you hear an incredibly brutal whine that sears your eardrums and within 3 seconds the dragster catches and passes you. He beats you to the finish line, a quarter mile away from where you just passed him. Think about it, from a standing start, the dragster had spotted you 200 mph and not only caught, but nearly blasted you off the road when he passed you within a mere 1320 foot long race course. Melanie Troxel (right, with engine on fire) beat Bob Vandergriff in the first round of the 2006 NHRA POWERade Drag Racing Series. All that from a car that must weigh at least 2150 lbs. and have an engine no larger than 500 cubic inches. One Top Fuel Dragster 500 c.i. engine makes more horsepower than the first four rows at the Daytona 500. I'll take acceleration over speed any day. Speed is the destination but acceleration is the journey! This should have been posted on the 15th. It would have made it a more appropriate memorial, but I've been playing a lot of catch up lately and missed it. Sorry about that but here it is anyway. On Nov. 15, 2003, an 85-year-old retired Marine Corps colonel died of congestive heart failure at his home in La Quinta, Calif., southeast of Palm Springs. He was a combat veteran of World War II. Reason enough to honor him. But this Marine was a little different. This Marine was Mitchell Paige. It's hard today to envision -- or, for the dwindling few, to remember -- what the world looked like on October 26, 1942. The U. S. Navy was not the most powerful fighting force in the Pacific. Not by a long shot. So the Navy basically dumped a few thousand lonely American Marines on the beach on Guadalcanal and high-tailed it out of there. You Navy guys can hold those letters. Of course Nimitz, Fletcher and Halsey had to ration what few ships they had. I've written separately about the way Bull Halsey rolled the dice on the night of Nov. 13, 1942, violating the stern War College edict against committing capital ships in restricted waters and instead dispatching into the Slot his last two remaining fast battleships, the South Dakota and the Washington, escorted by the only four destroyers with enough fuel in their bunkers to get them there and back. Those American destroyer captains need not have worried about carrying enough fuel to get home. By 11 p. m., outnumbered better than three- to-one by a massive Japanese task force driving down from the northwest,every one of those four American destroyers had been shot up, sunk, or set aflame. And while the South Dakota -- known throughout the fleet as a jinx ship -- had damaged some lesser Japanese vessels, she continued to be plagued with electrical and fire control problems. "Washington was now the only intact ship left in the force," writes naval historian David Lippman. "In fact, at that moment Washington was the entire U. S. Pacific Fleet. She was the only barrier between (Admiral) Kondo's ships and Guadalcanal. If this one ship did not stop 14 Japanese ships right then and there, America might lose the war. .."
On Washington's bridge, Lieutenant Ray Hunter had the conn. He had just seen the destroyers Walke and Preston "blown sky high." Dead ahead lay their burning wreckage. Hundreds of men were swimming in the water and the Japanese ships racing in. "Hunter had to do something. The course he took now could decide the war," Lippman writes. "'Come left,' he said. ... Washington's rudder change put the burning destroyers between her and the enemy, preventing her from being silhouetted by their fires. "The move made the Japanese momentarily cease fire. Lacking radar, they could not spot Washington behind the fires. ..." Washington raced through burning seas. Dozens of destroyer men were in the water clinging to floating wreckage. "Get after them, Washington!" one shouted. Sacrificing their ships by maneuvering into the path of torpedoes intended for the Washington, the captains of the American destroyers had given China Lee one final chance. Blinded by the smoke and flames, the Japanese battleship Kirishima turned on her searchlights, illuminating the helpless South Dakota, and opened fire. Finally, as her own muzzle blasts illuminated her in the darkness,Admiral Lee and Captain Glenn Davis could positively identify an enemy target. The Washington's main batteries opened fire at 12 midnight precisely. Her radar fire control system functioned perfectly. During the first seven minutes of Nov. 14, 1942, the "last ship in the U. S. Pacific Fleet" fired 75 of her 16-inch shells at the battleship Kirishima. Aboard Kirishima, it rained steel. At 3:25 a. m., her burning hulk officially became the first enemy sunk by an American battleship since the Spanish-American War. Stunned, the Japanese withdrew. Within days, Japanese commander Isoroku Yamamoto recommended the unthinkable to the emperor -- withdrawal from Guadalcanal. But that was still weeks in the future. We were still with Mitchell Paige back on the god-forsaken malarial jungle island of Guadalcanal, placed like a speed bump at the end of the long blue-water slot between New Guinea and the Bismarck Archipelago ... the very route the Japanese Navy would have to take to reach Australia. On Guadalcanal the Marines struggled to complete an airfield. Yamamoto knew what that meant. No effort would be spared to dislodge these upstart Yanks from a position that could endanger his ships. Before long,relentless Japanese counterattacks had driven supporting U. S. Navy from inshore waters. The Marines were on their own. As Platoon Sgt. Mitchell Paige and his 33 riflemen set about carefully emplacing their four water-cooled 30-caliber Brownings, manning their section of the thin khaki line which was expected to defend Henderson Field against the assault of the night of Oct. 25, 1942, it's unlikely anyone thought they were about to provide the definitive answer to that most desperate of questions: How many able-bodied U. S. Marines does it take to hold a hill against 2,000 desperate and motivated attackers? Nor did the commanders of the mighty Japanese Army, who had swept all before them for decades, expect their advance to be halted on some God- forsaken jungle ridge manned by one thin line of Yanks in khaki in October of 1942. But by the time the night was over, "The 29th (Japanese) Infantry Regiment has lost 553 killed or missing and 479 wounded among its 2,554 men," historian Lippman reports. "The 16th (Japanese) Regiment's losses are uncounted, but the 164th's burial parties handled 975 Japanese bodies. ... The American estimate of 2,200 Japanese dead is probably too low." You've already figured out where the Japanese focused their attack,haven't you? Among the 90 American dead and seriously wounded that night were all the men in Mitchell Paige's platoon. Every one. As the night of endless attacks wore on, Paige moved up and down his line, pulling his dead and wounded comrades back into their foxholes and firing a few bursts from each of the four Brownings in turn, convincing the Japanese forces down the hill that the positions were still manned. In the end, Sgt. Paige picked up the last of the 40-pound, belt-fed Brownings -- the same design which John Moses Browning famously fired for a continuous 25 minutes until it ran out of ammunition, glowing cherry red, at its first U. S. Army trial -- and did something for which the weapon was never designed. Sgt. Paige walked down the hill toward the place where he could hear the last Japanese survivors rallying to move around his flank, the belt-fed gun cradled under his arm, firing as he went. And the weapon did not fail. Coming up at dawn, battalion executive officer Major Odell M. Conoley was first to discover the answer to our question: How many able-bodied Marines does it take to hold a hill against two regiments of motivated, combat-hardened infantrymen who have never known defeat? But "In the early morning light, the enemy could be seen a few yards off, and vapor from the barrels of their machine guns was clearly visible," reports historian Lippman. "It was decided to try to rush the position." Joined by Paige, this ad hoc force of 17 Marines counterattacked at 5:40 a.m., discovering that "the extremely short range allowed the optimum use of grenades." They cleared the ridge. And that's where the unstoppable wave of Japanese conquest finally crested, broke, and began to recede. On an unnamed jungle ridge on an insignificant island no one had ever heard of, called Guadalcanal. But who remembers, today, how close-run a thing it was -- the ridge held by a single Marine, in the autumn of 1942? When the Hasbro Toy Co. called some years back, asking permission to put the retired colonel's face on some kid's doll, Mitchell Paige thought they must be joking. But they weren't. That's his mug, on the little Marine they call "G.I. Joe."